Much of the economic news immediately after the New Year was decent, even hopeful. The Institute for Supply Management's Manufacturing and Non Manufacturing indices moved more solidly into expansion. Payroll and benefits giant ADP told us that the economy added 297,000 seasonally adjusted private-sector jobs in December, that report's best monthly number in years. Then came Friday's Employment Situation Summary from Uncle Sam's Bureau of Labor Statistics. At first glance, that news also seemed acceptable. Seasonally adjusted, the national unemployment rate dropped from 9.8% to 9.4% in December, while employers added 103,000 jobs. The latter number trailed both expectations and ADP's earlier report, but given the vagaries involved in seasonal adjustments, maybe it wasn't all that bad. Unfortunately, it was pretty bad. December's BLS report capped off a year during which the post-recession consequences of Obama administration policies became all too clear. Two and a half years in, what I have been calling the POR (Pelosi-Obama-Reid) economy since the middle of 2008 has created a workforce which is disengaged and underemployed at levels not seen since the 1930s -- which, not coincidentally, is the last time a Democratic administration's supposedly stimulative policies created a long-term, high-unemployment economy. Almost half of December's unemployment rate drop occurred because on a seasonally adjusted basis, 260,000 people left the workforce. During 2010 (not seasonally adjusted, because it's a year-over-year comparison), the civilian 16-and-over population increased by almost 2 million, but the ranks of those either working or looking for work only grew by 500,000. A primary reason for this is that a record number of those who could applied for Social Security retirement and disability benefits. Many surely would not have done so in a more favorable job market. December's seasonally adjusted workforce participation rate was 64.3%. The last time this rate was so low was in 1984, when many more families were intact and had one parent staying at home. The teenage workplace disengagement epidemic I addressed in September has become even more awful. In 2010, the 16-19 age group's participation rate and employment-population ratio averaged under 35% and under 26%, respectively. Both were all-time lows by far. If the current rate of decline in the latter measurement continues, there may not be a single teenager employed anywhere in a dozen years. 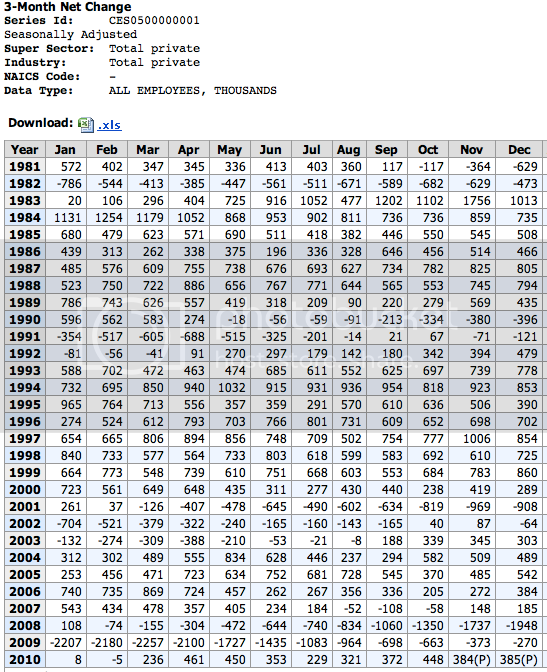 It's also hard to find much consolation in the number of jobs added during December, or even during 2010. 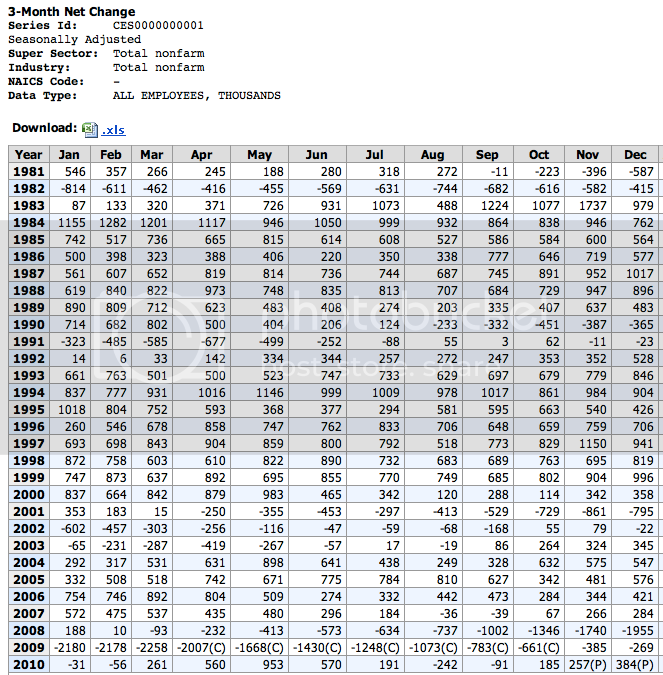 December's not seasonally adjusted job results were worse than every December from 2003 to 2007. 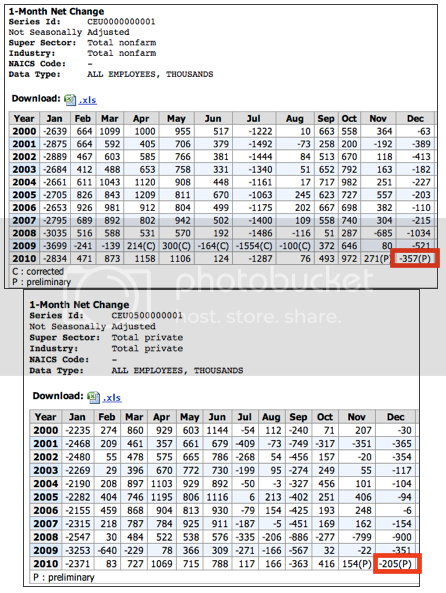 That indicates deterioration, as November 2010's analogous figure was in the lower-middle end of the November 2003-2007 range. In a real recovery from a deep recession, this should not be happening. Well over 20% of the 1.35 million private-sector jobs added in 2010 came from temporary help services, even though that sector is less than 2% of total employment. Well, at least the numbers are positive, and that's good enough, right? Wrong. The real benchmark for evaluating this recovery's employment and economic growth should be the post-recession, tax cut-driven Reagan recovery. In that contest, it's Reagan in a rout.